As a $3.6-billion business, there is no longer any doubt of Canadian sport tourism’s impact on everything from economics, to community and recreational infrastructure, to quality of life. However, the lack of a sport hosting policy can be a major impediment to hosting sport events at the municipal level. Sport hosting policies are meant to provide consistency and clarity on matters such as funding and legal issues, so that local sport organizations can mount competitive bids for national and international events. It’s something Randy Fernets, director of industry development and sports tourism for Tourism Saskatoon, knows all too well. The city was shortlisted to host the massive 2007 World University Games, only to be forced to drop the bid after city council cooled to the funding proposal. The economy was heading into a recession, and councillors were worried about raising taxes to cover the cost. Although Saskatoon continues to operate without a sport hosting policy, Fernets is unequivocal regarding its importance in attracting major national and international events. Especially when factoring in the shifting sands of municipal governance – where every municipal election can mean a new set of councillors who have their own vision for a city and how budgets should be allocated. year added an International Amateur Sport Hosting category to its Ministry of Tourism, Culture and Sport grants program. 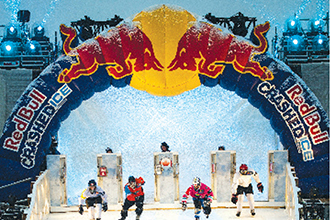 Funding is provided to help municipalities and sport organizations deliver major international amateur sport events. And, as competition between host cities increases, municipalities are developing their own policies to help streamline the bidding process. The city of London, Ont. through Tourism London, is an early adopter thanks to the very successful Canada Summer Games it hosted back in 2001, which generated more than $63 million in economic impact. The city’s commitment, according to Cheryl Finn, director of sport tourism at Tourism London, has continued to pay dividends. 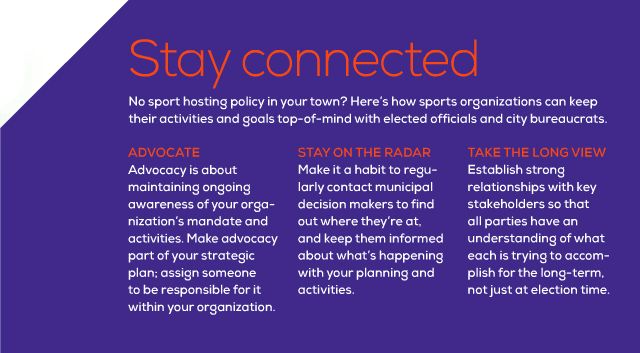 What’s the first step to developing a good sport hosting policy at the municipal level? According to Finn, it’s all about community engagement. and can be applied to any size of event. Fernets is still pushing for a sport hosting policy to be developed in Saskatoon, often citing the city of Calgary as the shining example of how to do it the right way. He encourages cities to think big and act big when it comes to developing a policy.